Saturday night Sarah hosted the third annual Holiday Oyster Extravaganza, in which we prepare and consume 100 oysters (along with a liberal dose of booze). Shucking 100 oysters is no easy feat, but Mark once again rose to the occasion. 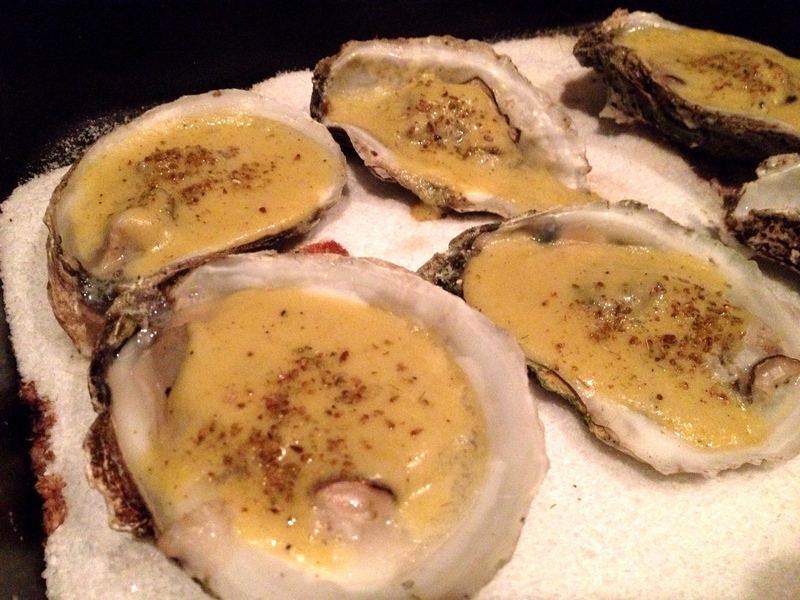 As usual, I was in charge of the oyster accoutrement. 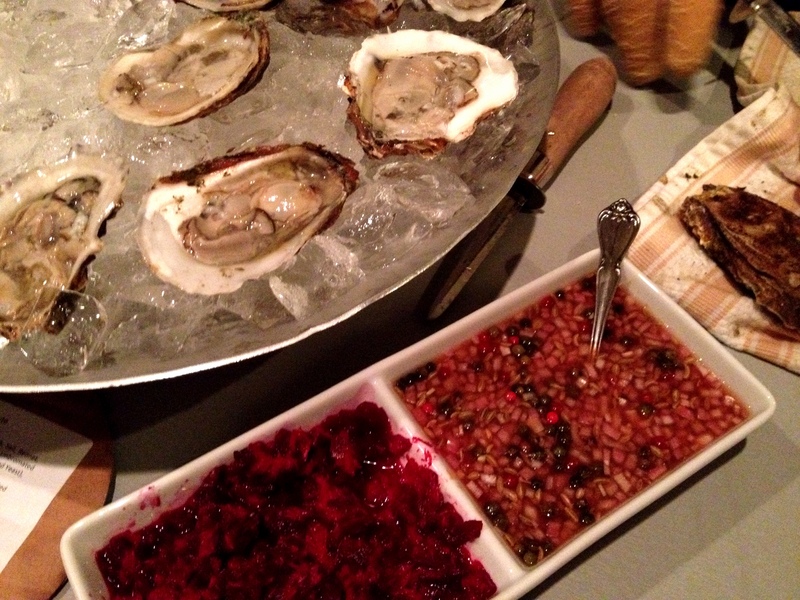 This year’s raw oysters got a toasted fennel mignonette and a beet and horseradish relish. The roasted version featured a fennel-saffron cream. The Blue Points were delicious, but I’m here to talk eggs. 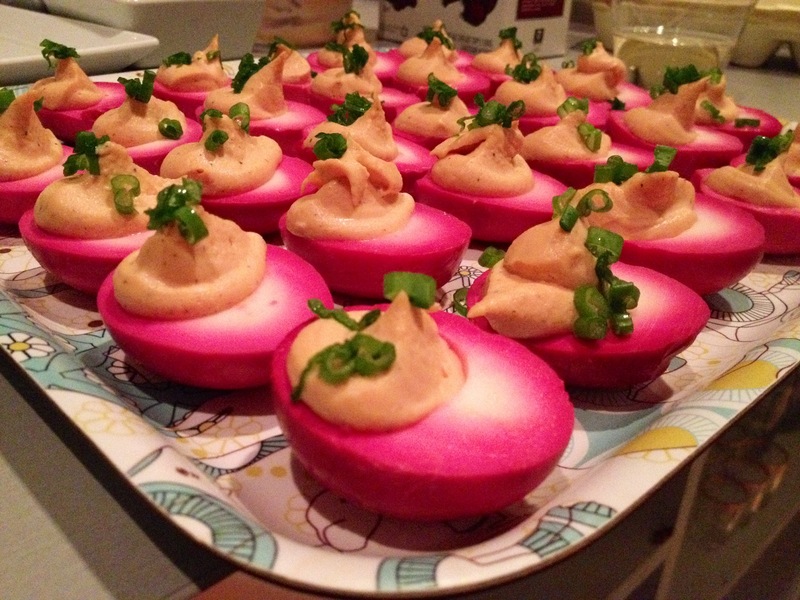 Much as I love eggs in all their forms, I’ve had trouble keeping up with the share I get from my CSA, so I had resolved to prepare deviled eggs for Saturday’s party. On Thursday night I wrapped up my third semester in NYU’s Food Studies program and went out with friends to toast a month of pleasure reading. 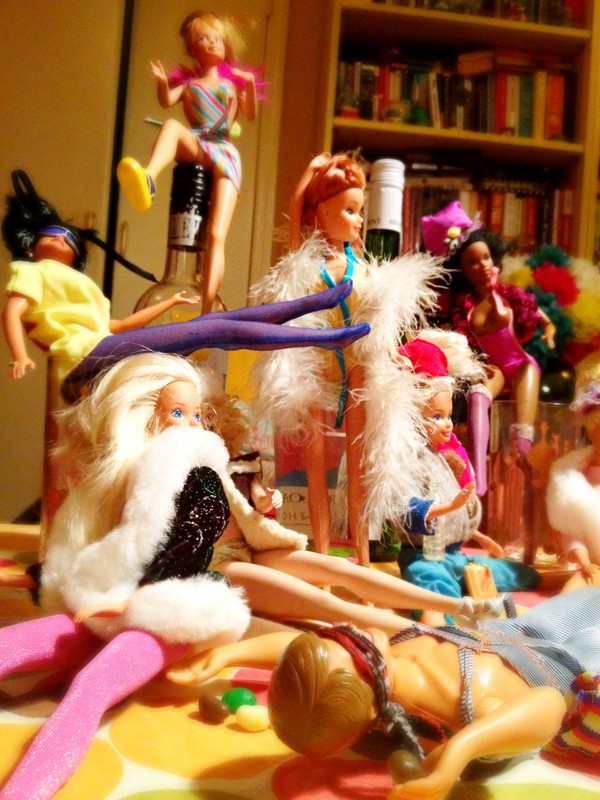 I got home late and tipsy, but determined to get a head start on prepping for the party. Rooting through the fridge for a snack while my eggs cooked, I stumbled on some beets that were looking a little worse for the wear. This got me thinking. A few years back a friend and I spent a weekend checking out Pennsylvania’s Amish Country. 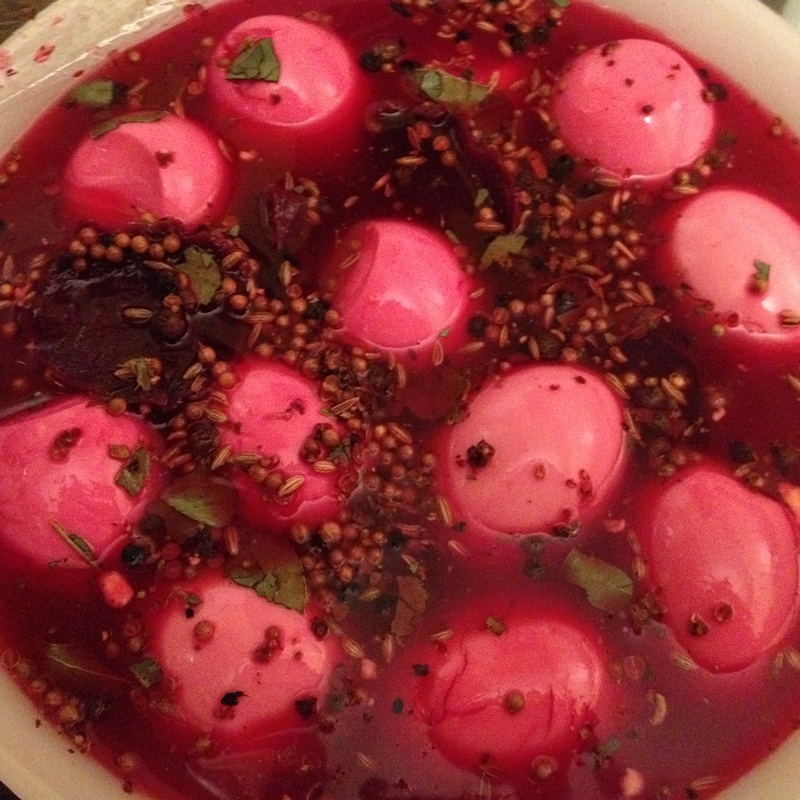 We had occasion to dine at a smorgasbord, where I stumbled on the delight that is a beet-pickled boiled egg. As previously confessed, I am a sucker for a hard-boiled egg. 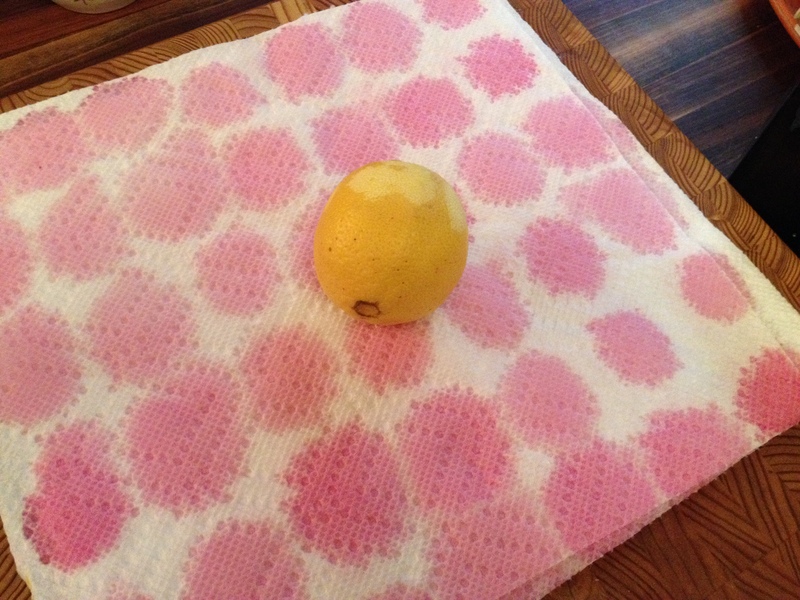 Throw in tangy flavor and an outlandish pink hue and I am putty in your hands. Pre-heat the oven to 400. 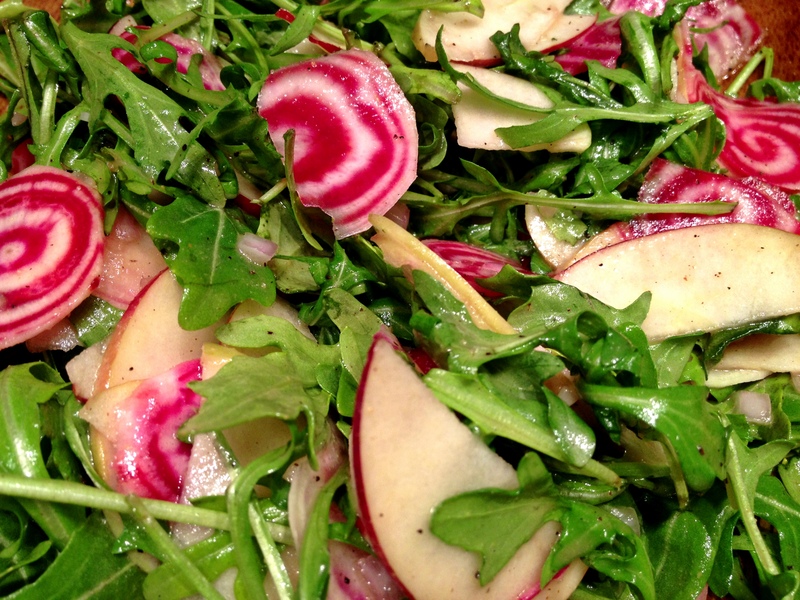 Rinse the beets, toss them with the olive oil in a small pan and stick in the oven. Cook until tender (about 45 minutes). Boil the eggs using your own technique or according to my interpretation of Betty Crocker’s failsafe recipe. 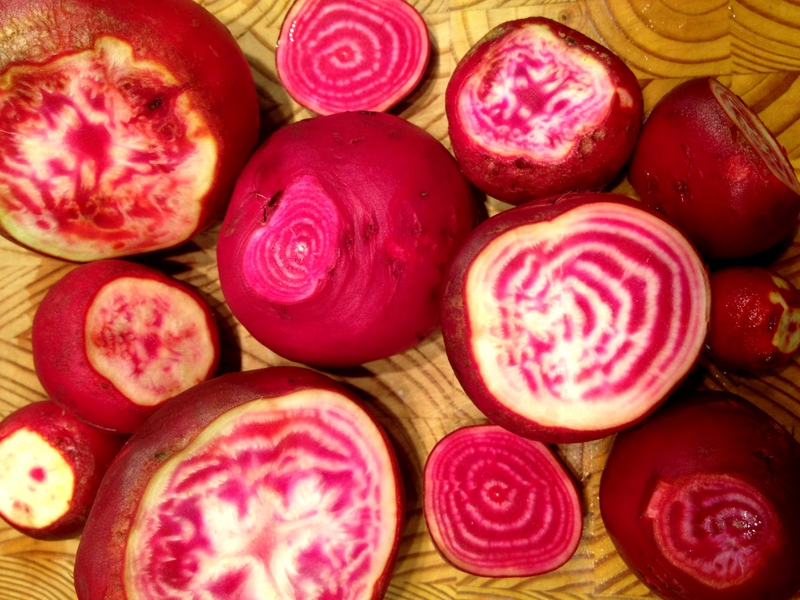 Once the beets are cool enough to handle, peel and slice them. Add these to a large jar or a bowl along with the vinegar, salt, sugar and spices. 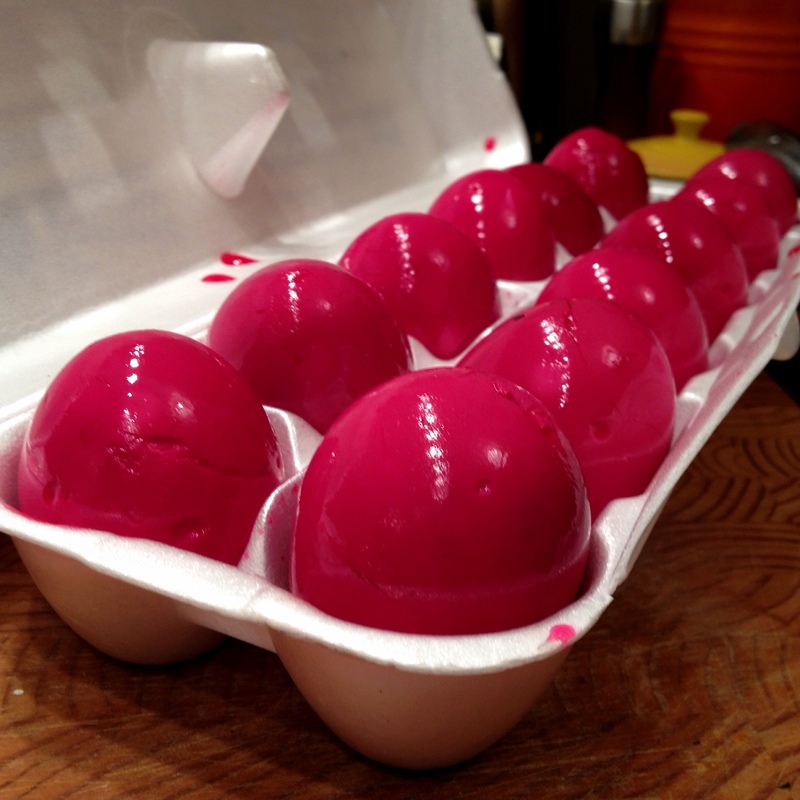 Peel the eggs and add them to your brine, taking care not to splash the fuchsia liquid all over your white tank top. Place a lid or some plastic wrap over the top and pop it in the refrigerator. Let these sit for 12 to 24 hours, stirring at least once to make sure they take the color evenly. I left mine in the brine until I got home from my office holiday party the following night and this is what they looked like. 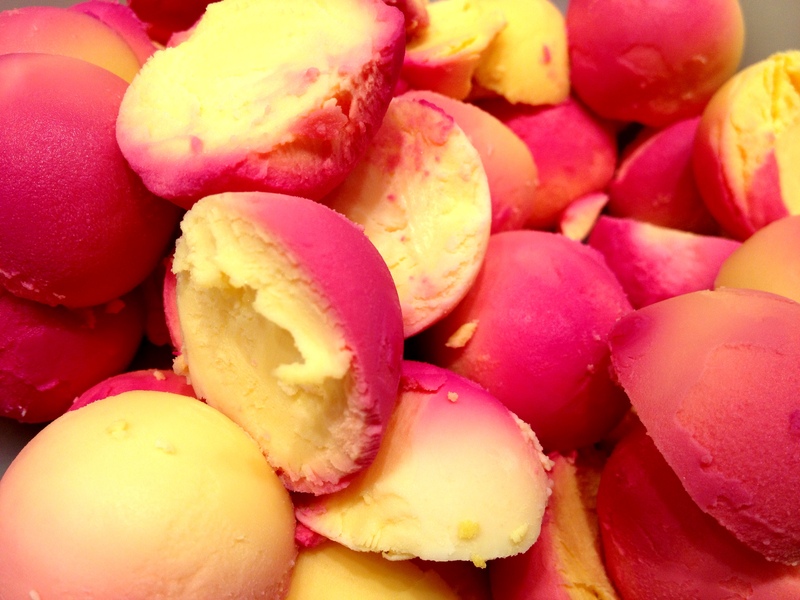 Fish the eggs out, pop them in the fridge to dry, and snack on the pickled beets. Still not a good time for a white tank top. Carefully slice your eggs in half lengthwise and pop the yolks into a bowl. If you’ve left them in for the full 24 hours, the yolks will be quite a sight, as will the paper towel where you set the halved eggs. Using a fork, mash the yolks roughly with the mayonnaise, mustard, mustard powder, salt, plenty of freshly-ground pepper and anything else that strikes your fancy. Press the mixture through a sieve for a refined, creamy filling. Or don’t. Taste the mixture and tweak as you see fit. I added a pinch of sugar and probably some other stuff I can’t recall. Let the filling chill until just before you are ready to serve. Spoon it into a freezer-worthy plastic bag, snip the corner and pipe the filling directly into the egg (not so) whites. Or just glob it in with a spoon. Garnish with the scallion greens because none of the crappy stores you went to had chives and a little green makes the eggs look more like food and less like some sort of alien life form. The eggs were a smashing success, as was the party. The guests laughed. The Christmas tree twinkled. The yule log crackled on the flat-screen television. 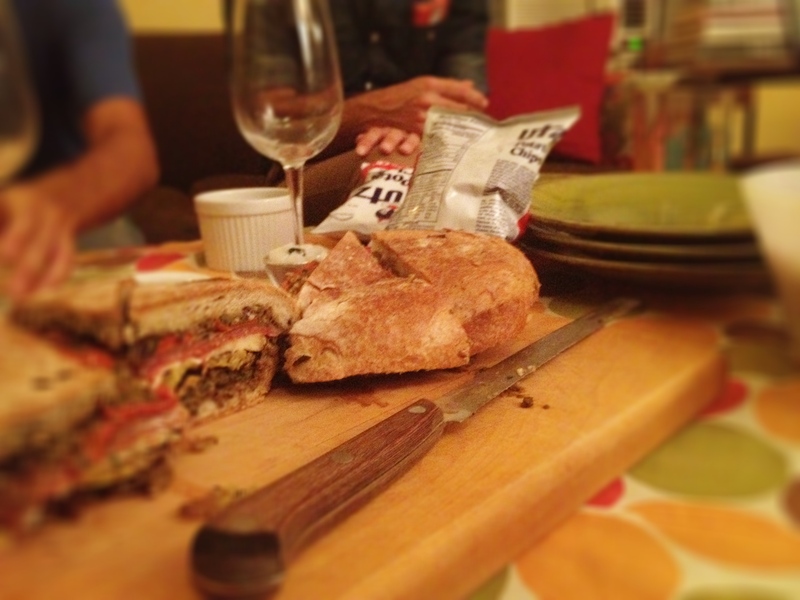 At some point in the night, Prosecco and oysters gave way to rum and hunks of leftover cheese. Eventually, I was forced to brave the elements. A daylong snowfall had turned into freezing rain. The streets were slushy and abandoned. 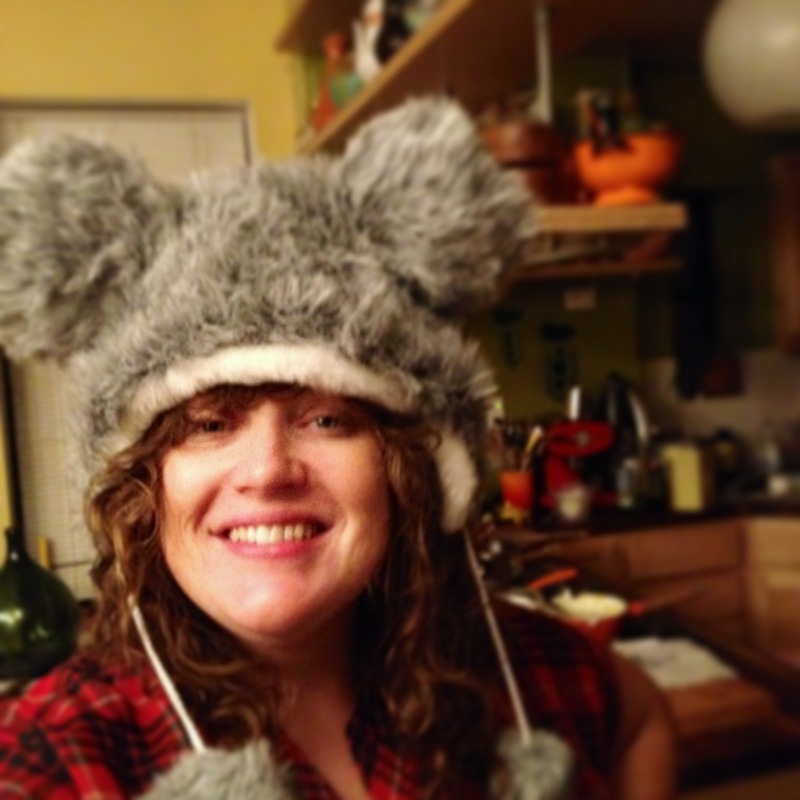 My newly acquired hat and I got home a little before 3:00am. I had a devilishly good time at this year’s Oyster Holiday Party, but will confess to feeling a bit pickled come Sunday morning. 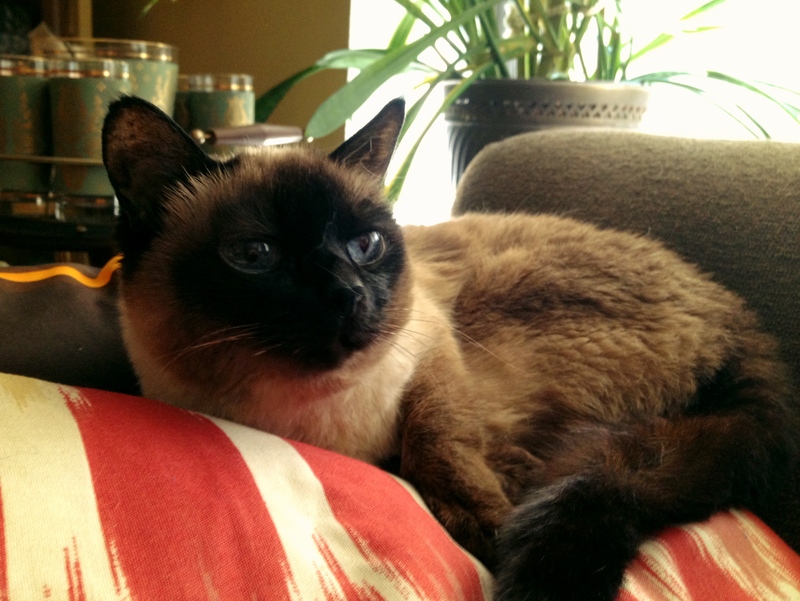 I adopted Jezebel around 1999. She was so small that I quite reasonably assumed she was a kitten. But the vet put her at about three years old. Jezebel remains a delightful companion, despite her recent propensity for late night yowling. (The internet suggests that dementia is likely.) As you can see, whatever’s happening in her brain, she’s managed to hold onto her good looks. As tiny as she was when she found me, Jezebel is now down under five pounds, so I tend to feed her whatever she wants. 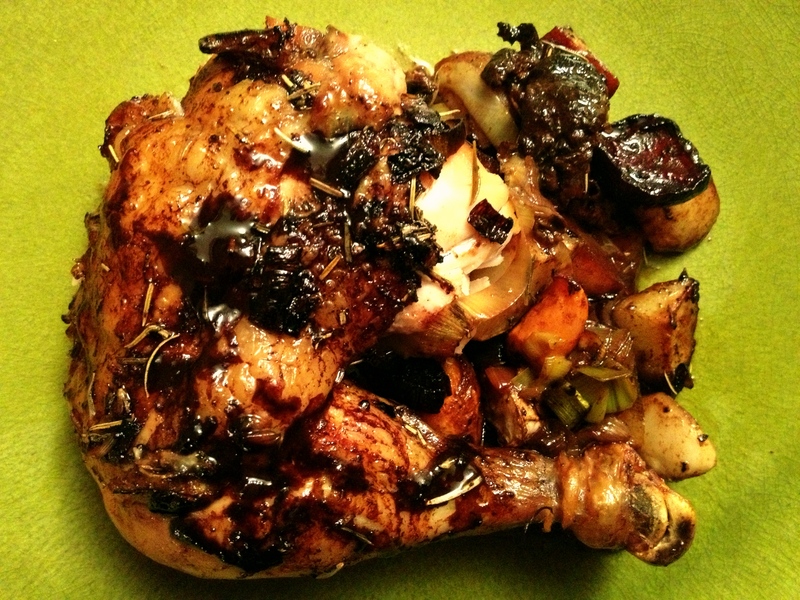 She and I only made our way through a small bit of this truly scrumptious Provencal-style roast chicken tonight, but I am confident that it will be just as good throughout the week. While I once confined myself to white meat off the bone (a holdover from my vegetarian upbringing and subsequent squeamishness), I love roasting a whole chicken. The smell permeates the house. It’s economical. It leaves you with bones to make stock. And a whole chicken can be communal–even when it’s just you and your cat. Preheat the oven to 375 degrees. Bring a cup of water to a boil and pour over the dried porcini. Slice the ends off of the lemon, score the sides and stuff it inside the bird. Combine a tablespoon of kosher salt, a good amount of freshly-ground pepper and a tablespoon of the Herbes de Provence in a small dish. Rub this all over the bird, being sure to get under the skin to massage it into the breast meat. If you’ve got some kitchen twine and you can find a way to access it while your hands are covered in raw chicken, truss the legs. If not, whatever. Set the bird in a roasting pan breast-side down, drizzle some olive oil over the top and pop it in the oven. After 30 minutes or so, flip the bird over and baste with the pan juices. If the bird hasn’t released much fat, you can use a little more olive oil. You might also sprinkle the top with additional salt, pepper and herbs if you like. After another 30 minutes, slide the bird to the side and add your leeks and root vegetables. (I went with turnips, carrots, beets and potatoes because that’s what I had on hand.) Stir these with the pan juices and then add 1/2 tablespoon of the Herbes de Provence, salt, pepper and the porcini along with their liquid. Mound the vegetables in the center, flip your chicken so that it is once again breast-side down and place it on top of the vegetables. Continue cooking, basting the bird with the juices approximately every fifteen minutes and stirring the vegetables if needed. It should take roughly 20 minutes total cooking time per pound, but start checking your chicken whenever you get anxious or when the aroma starts to make you dizzy. I recommend ignoring whatever guidelines your thermometer may suggest and, instead, aim for getting the deepest part of the thigh up around 165 degrees. Be sure to let it rest for about five minutes out of the oven. 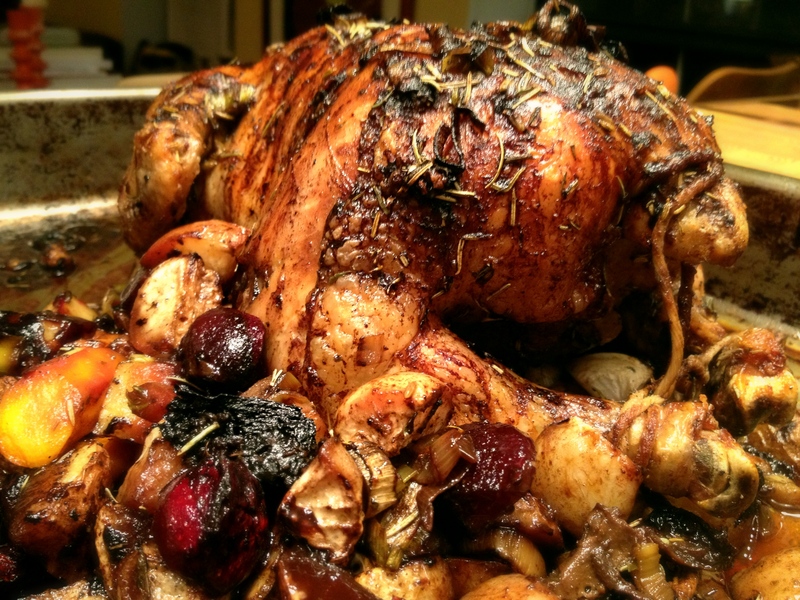 If you’re worried about the bird getting cold, tent it very loosely–lest you steam that beautiful, crisp skin–with foil. Were I serving this to a crowd, I would have placed the chicken on a platter, mounded the vegetables around it, and carved at the table. Instead, I hacked off of a leg and got to work. Last night I was supposed to meet friends in Prospect Park for a screening of The Muppet Movie. Mother Nature had other plans. I’d been prepping for a picnic, but a blanket over the coffee table would have to suffice. On the menu: a Pressed Picnic Sandwich, Quick-Pickled Kale and Beets, Potato Chips (lifted from Thursday’s Prospect Park Alliance fundraiser) and a boatload of rosé. This isn’t so much a recipe as a concept. The idea here is to layer a bunch of tasty ingredients in a logical order and then to press the sandwich with a weight. I started with a round, day-old olive loaf from BKLYN Larder, but imagine you could use any rustic loaf with a nice crust. I sliced the loaf in half horizontally and scooped out most of the soft stuff with my hand, leaving about 1/2 inch all the way around. 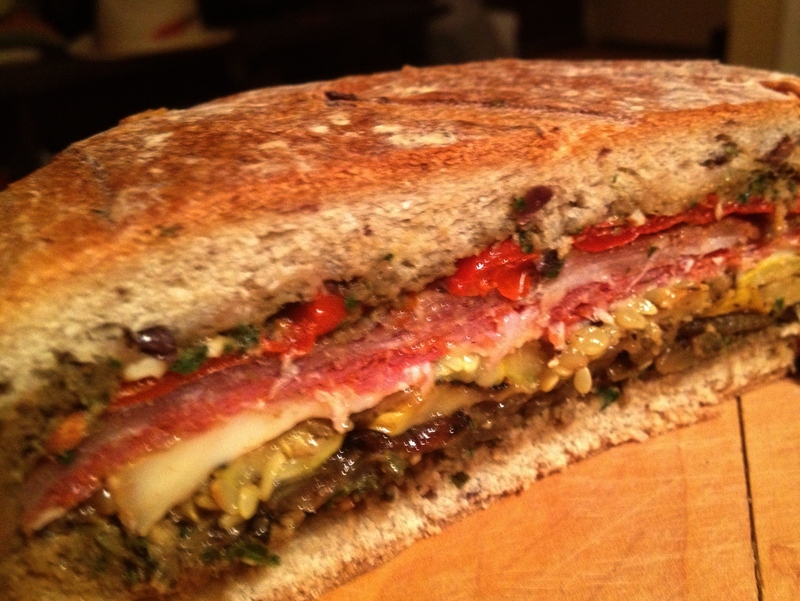 I then slathered the inside, top and bottom with a homemade tapenade (oil-cured black olives, anchovies, basil, garlic scapes, almonds, balsamic vinegar, Dijon mustard, capers, and whatever else was lurking in my fridge.). You could use prepared tapenade or pesto or even some herbed mayonnaise. The key is that you need a layer with some fat in it to prevent the bread from getting soggy. I then added a layer of browned onions followed by strips of grilled summer squash. (I like to do this in a hot cast iron pan and then sprinkle the vegetables with smoked sea salt to give them the depth that comes from outdoor grilling). Next up was an Italian cow’s milk cheese. I’m blanking on the name, but it was creamy and a little tart, which provided a nice counterpoint to the sweetness of the veggies. Then layers of hot sopresatta, prosciutto and peppadew peppers. As you can see, it sliced beautifully. Combine all but the last two ingredients along with ½ cup of water in a small saucepan, bring to a boil, reduce heat to low and let simmer for 20-30 minutes to give the spices a change to release their flavor into the brine. In a separate pot, add the beets, cover with water, bring to a boil and cook until they give when pierced with a fork (approximately 30 minutes). Pull the beets out and add the kale, starting with the stem pieces. Let this boil for a few minutes and then drain. When beets have cooled, peel and slice them. 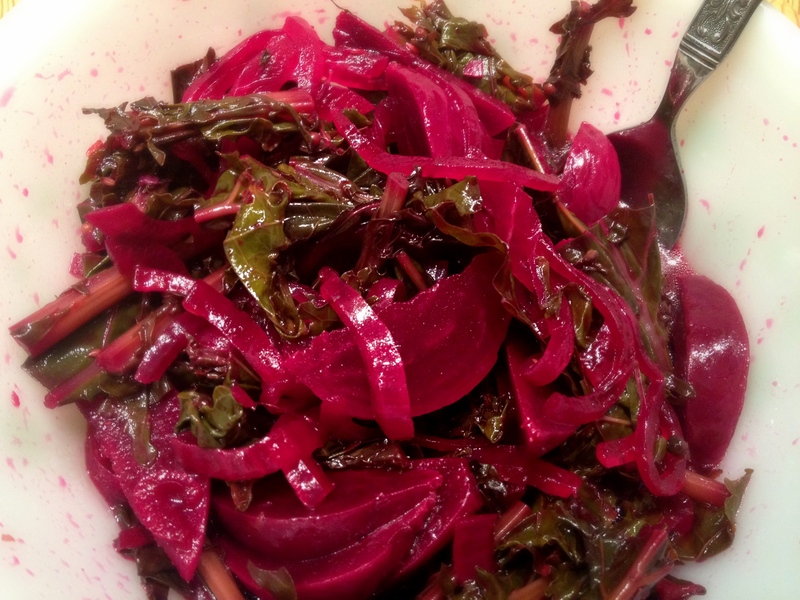 Combine beets, kale and brine in a jar or plastic container and let sit for at least one hour, making sure to stir if the brine doesn’t fully cover the vegetables. The living room picnic continued with a trip to the wine shop for reinforcements, a Barbie styling session and fresh nectarines and rum over salted caramel ice cream. Regrettably, it did not conclude with any efforts to clean up. 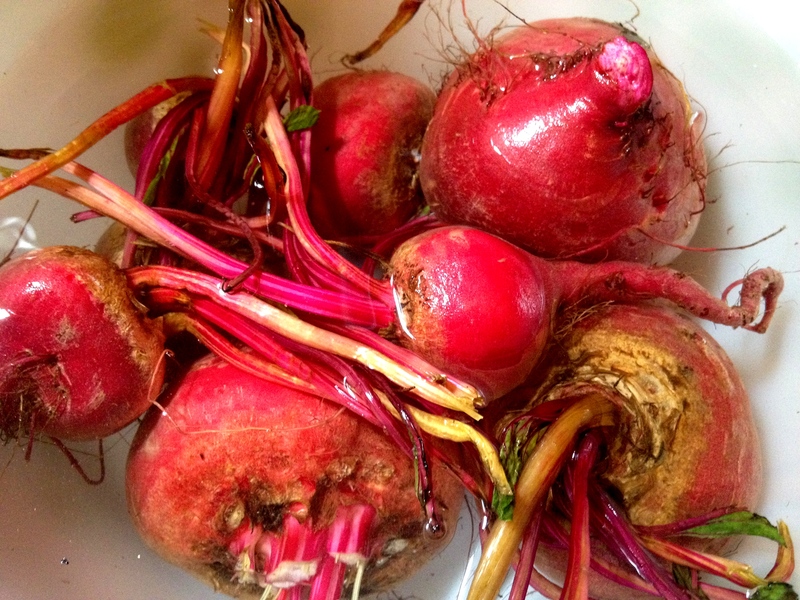 Last week’s CSA share included a handful of beets. I knew they would keep until this week, when I had a hunch I’d be getting some more. Sure enough, Tuesday brought another bunch–along with some of the crispest cucumbers I’ve ever tasted. 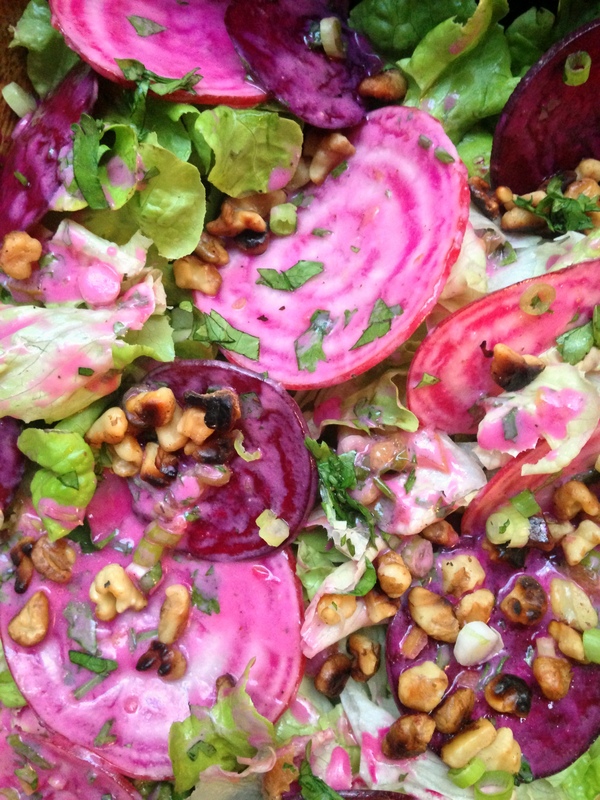 That very day, NPR reported that this is the hottest summer on record in the U.S. Roasting the beets was out of the question. But cold borscht was not. 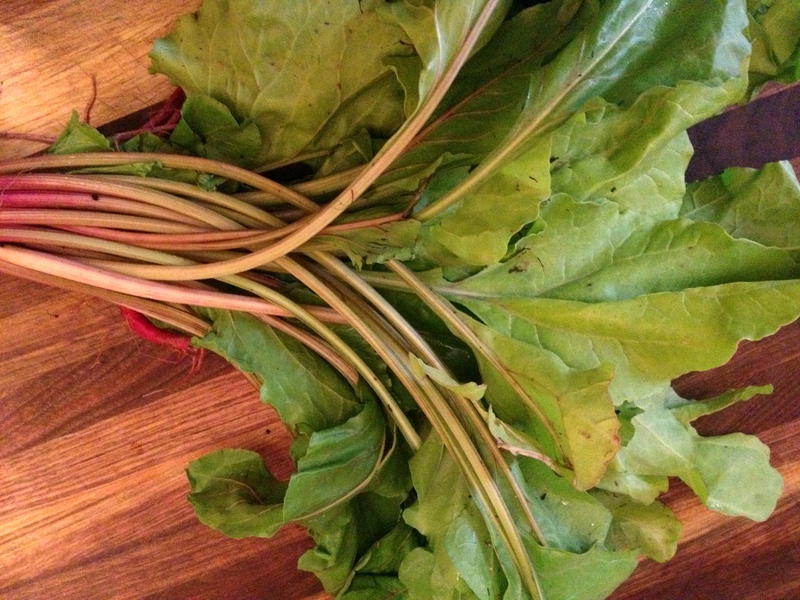 I boiled my beets and eggs while preparing my morning coffee and a garlic, beet greens and egg scramble that I ate with a sliced fresh tomato–the first of the season! With the hot work completed early in the day, dinner preparation would really just be a matter of assembly. Whisk minced dill and crème fraiche, sour cream or plain yogurt into soup and season to taste with fresh-ground black pepper, salt and/or vinegar. 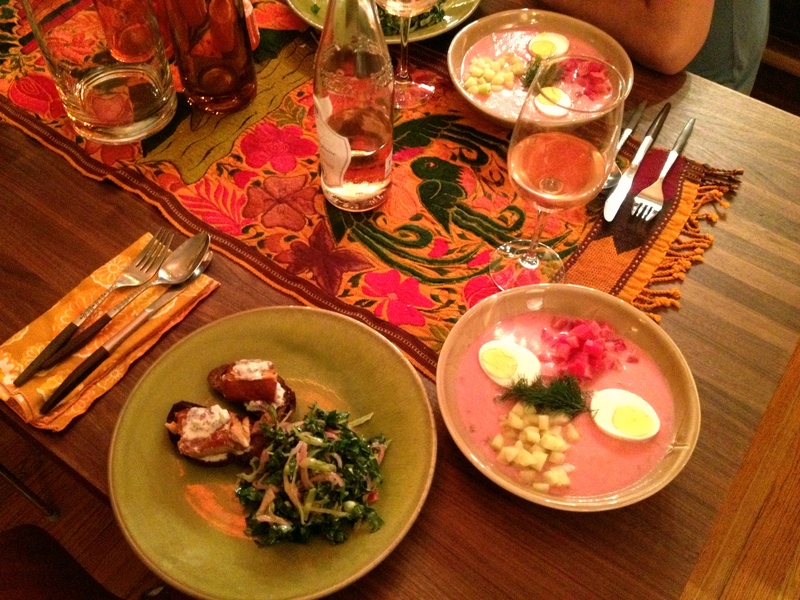 Ladle soup into bowls, garnishing with halved eggs, beet and cucumber cubes and sprigs of dill. 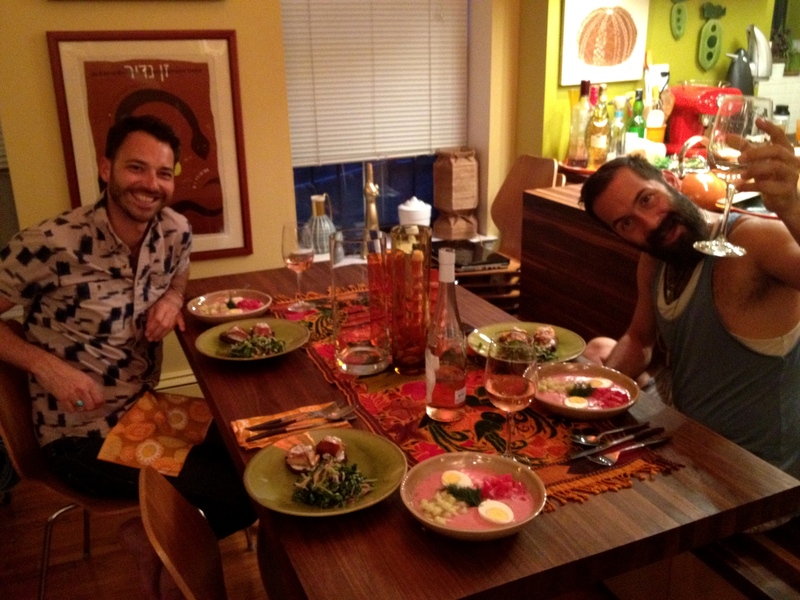 An earthy rosé rounded out our feast, though I suppose that vodka would have been more traditional.